The Town Known as "The Widow Maker"
Once one of southeastern Nevada’s most prominent mining camps, Delamar has suffered as much abuse and neglect as any ghost town in the state. The town’s story began in 1890-91, when farmers from the Pahranagat Valley in eastern Nevada uncovered gold in the area. By 1892, the Ferguson Mining District was established and miners from nearby Pioche began prospecting the area. A year later, Captain John De Lamar of Montana acquired most of the principal claims in the district, which was renamed after him (although it was later changed slightly to Delamar). De Lamar invested in the district, which between 1895 and 1900 was the most productive mining area in the state. A post office was opened in 1894 and within three years the camp had grown into a full-scale town with about 3,000 residents, shops, saloons, hotels, a hospital, churches and a newspaper, The De Lamar Lode, which continued publishing until 1906. Delamar, however, soon gained notoriety as a very dangerous place to work. Water was scarce and the dry drilling techniques used to extract gold from the rock generated a fine silica dust (called the Delamar Dust) that resulted in silicosis, a painful and ultimately fatal lung disease. In fact, many miners began referring to Delamar as “the Widow Maker” because of the high death rate. Despite its deadly reputation, the town thrived because local mine owners paid exceptionally high wages for the time, $3 per day. Additionally, by the late 1890s, Nevada was experiencing a statewide mining slump—Virginia City and Austin had ceased producing much ore while Tonopah and Goldfield were yet to be discovered—so many miners were eager for work. Eventually, a water pipeline was installed to carry water from Meadow Valley Wash, located 12 miles north. The arrival of a reliable water source finally improved working conditions in the mines but not soon enough for those who were afflicted with lung disease. About half of Delamar was destroyed by fire in 1900. The town was rebuilt but two years later De Lamar sensed the boom was over and sold his mining interests. New owners continued operations until about 1909. During its decade-and-a-half of operations, Delamar generated more than $13 million in gold. With its principal industry closed, Delamar began a quick decline. Although there were periodic revivals of the mines, the district proved to be played out. Photographs from the 1950s show that Delamar still contained fairly substantial ruins up to that time. Local folks recall that until the 1960s, visitors to Delamar could still find a house with a piano and partial furnishings, as well as a saloon that contained liquor bottles that had been partially melted by fire. But during the next two decades, souvenir-hunters discovered Delamar and hauled out nearly anything that could be removed. Even some of the headstones at the Delamar cemetery (which is still there, north of the town site) were taken. Today, Delamar has been reduced to a handful of stone foundations and partial buildings peeking through the sagebrush. Below the town site are thick wooden beams that were once part of the local stamp mill. 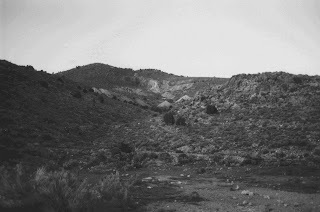 The hillsides around the town are littered with tailing mounds and there is a large depression, which appears to have once been the site of considerable mining activity, which can be seen near the top of the mountain that overlooks the town. Delamar is located about 28 miles southwest of Caliente via U.S. 93 and a marked, four-wheel drive gravel and dirt road. You drive about 15 miles on the dirt road, through a forest of Joshua trees, before reaching the site. The road is not recommended for passenger cars. For more information, check out http://www.ghosttowns.com/states/nv/delamar.html. Some of the most historic buildings still standing in the eastern Nevada town of Ely are found in a district known as East Ely. Located directly east of the main part of Ely, East Ely largely owes its development to the Northern Nevada Railway, which had its maintenance yards and depot in that part of town. The East Ely area includes all of the buildings along East 11th Street, which for many years as a kind of second commercial district for the community. During the railroad’s heyday, the several blocks on 11th Street, between the depot and Aultman Street, housed everything from banks to grocery stores to hotels. The most prominent East Ely structure is the historic two-story sandstone Nevada Northern Railway depot, which was built in 1907. The handsome structure, on the north end of E. 11th Street, served as the main station and home office of the railroad, which operated between 1907 and 1981. 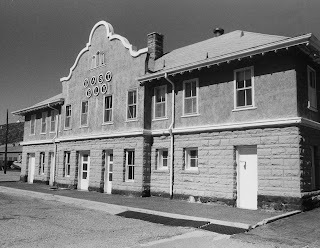 These days, the depot is the centerpiece of the Nevada Northern Railway Museum and Historic Railroad complex, which includes the maintenance buildings, rolling train equipment and tracks. Train rides are offered on selected weekends during the summer months. Adjacent to the depot is the Nevada Northern’s former communications building, now used as museum and railroad offices, which was built in 1915. The two-story, brick, utilitarian structure once served the offices of the railroad’s superintendent, trainmaster, chief clerk and roadmaster. On the opposite side of the depot is the wooden railroad freight and express building, which is believed to be the oldest structure in the complex (erected in about 1906). Wandering up East 11th Street, you can still find other reminders of the area’s railroading past. For example, the elegant, shaded red brick home on the corner of 11th and A streets was built in 1937 for a former railroad official. The former Nunnelly’s Ely City Grocery building at 2200 East 11th has, in recent years, been restored into a bed and breakfast called the Steptoe Valley Inn. The wooden structure was built in 1907 and originally served as a grocery store and saloon (a wall separated the two businesses). In later years, it was an apartment house and a single-family home. The Bank of Ely building at 298 East 11th, built in 1907, is one of the most impressive survivors of East Ely’s glory days. The brick structure served as the Copper National Bank from 1910-1925 and was later home of the Ely Power and Light Company. More recently, it has been used as offices. • Former East Ely Post Office and White Pine News Office at the corner of D and East 11th. Built in 1907, the single-story brick structure was originally a saloon, then became the print shop for the White Pine News. From about 1912 to the 1950s, half the building was used as a post office. • Gunn-Thompson Building at 1095 Avenue D. This large, two-story brick building was constructed in 1907 by George E. Gunn and William B. Thompson, who were prominent in the development of Ely’s copper industry. For many years, it served as mining company offices with apartments on the second floor. • Miller’s Lincoln Highway Garage at 1120 Avenue C. This single-story rectangular structure, which has been remodeled many times over the years, can trace its roots to a small wooden building (since incorporated into the rest of the structure), which was erected in 1906. In 1925, E.R. Miller built a larger structure around the original building, which was used as a garage. In the 1940s, it was sold to the White Pine County School District. The community of Ely was founded in the late 1800s, following the discovery of rich mineral deposits in the area. The first mining involved gold and silver but later, it was found that the region was flush with copper—which eventually became the most moneymaking mineral in the state. For more information about Ely contact the White Pine Chamber of Commerce, 636 Aultman, Ely, NV 89301, 775-289-8877 or http://www.whitepinechamber.com/. With a name like Dogtown, it’s no wonder this Eastern California mining camp didn’t ever amount to much. The unflattering moniker derived from the miners’ term for a primitive camp with few amenities—in other words, where you lived like a dog. 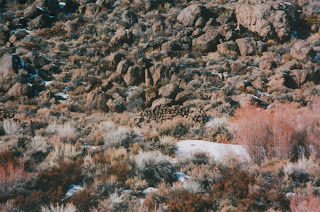 Dogtown is considered the first settlement or camp founded by prospectors working in the Eastern Sierra region. Established in about 1857, the camp’s initial residents were placer miners who began working a nearby creek (now known as Dogtown Creek). According to historians, either Cord Norst or Leroy Vining was the first miner to find gold in the area and construct a basic rock hovel above the creek. The discovery generated a bit of buzz among local miners and by 1858 more than 100 had settled in the camp and were scouring the region for little specs of gold color. Because of a lack of building materials in the area, most of their dwellings were little more than stone shacks. Dogtown’s dog days came quickly. In July 1859, Cord Norst—who may or may not have founded Dogtown—was wandering a wash about 5 miles to the east and make a more substantial gold discovery. Initial reports were that gold was just lying around on the ground for the taking. While this was no doubt an exaggeration, within a short time nearly everyone in Dogtown packed up and relocated to the more promising site, which was named Monoville because it overlooked Mono Lake. Additionally, some miners began searching for the source of the gold that was being washed into Dogtown Creek and found that it was coming from Dunderberg Mountain, located to the west. Many moved onto the slopes of Dunderberg, where several mines soon developed. Chinese miners moved into Dogtown after most of the previous inhabitants had moved to more productive mining districts. For the next ten years, the Chinese successfully reworked the large tailing piles left over from the earlier boom. Meanwhile in Monoville, residents found that water was only available on a season basis, and built an 14-mile ditch to transport water from the East Walker River for hydraulic mining. By late 1860, Monoville boasted more than three-dozen wooden houses, hotels, a post office, all those saloons and a population estimated at between 500 and 2,000 people. There was even talk of locating the Mono County seat in Monoville. Monoville began to decline in 1861 with the discovery of significant silver and gold deposits in nearby Aurora and Bodie. The Monoville post office closed in April 1862 and within a short time nearly all the businesses had closed. In the late 1870s and early 1880s, the diggings at both Dogtown and Monoville were reworked. Today not much remains at either Dogtown or Monoville. The former site of Dogtown can be seen from U.S. 395 at a point six-tenths of-a-miles south of the turn-off to the ghost town of Bodie. A California Historic Marker indicates the site and provides a brief history of the community. Exploring the Dogtown site, you can still find a handful of stone walls and depressions, which were part of the old dugout homes. The best ruins are along the cliff that is above Dogtown Creek. At Monoville, which is one mile east of Conway Summit in Rattlesnake Gulch, the most prominent reminders of the area’s past are traces of the old water ditches and the deep scars of the hydraulic mining that once used to wash away the gold. The easiest way to reach Monoville is to head east on a dirt road located about one mile north of the junction of U.S. 395 and State Route 167. The grand opening of the Legends at Sparks Marina shopping/dining/entertainment mega-complex this summer puts a spotlight on the former railroad town of Sparks, which celebrates its 105th birthday next year. Legends is a $1.2 billion development that includes a hotel-casino and the region’s largest shopping mall with some 50 tenants including Scheels All Sports store (already open), Banana Republic factory store, Converse, Nike Factory Store, Saks Fifth Avenue Off 5th and other vendors. The grand opening is scheduled for June 18. As for the history of Sparks, the community was formally incorporated on March 15, 1905. The community, however, can trace its roots to a few years earlier when the Southern Pacific Railway Company decided to shorten and straighten its main line across Northern Nevada. The railroad rerouted its tracks along the eastern Truckee River corridor to eliminate several dangerous curves and grades. In about 1903, the railroad announced that as part of this realignment it would relocate its main division point in the region from Wadsworth to a site about four miles east of Reno. 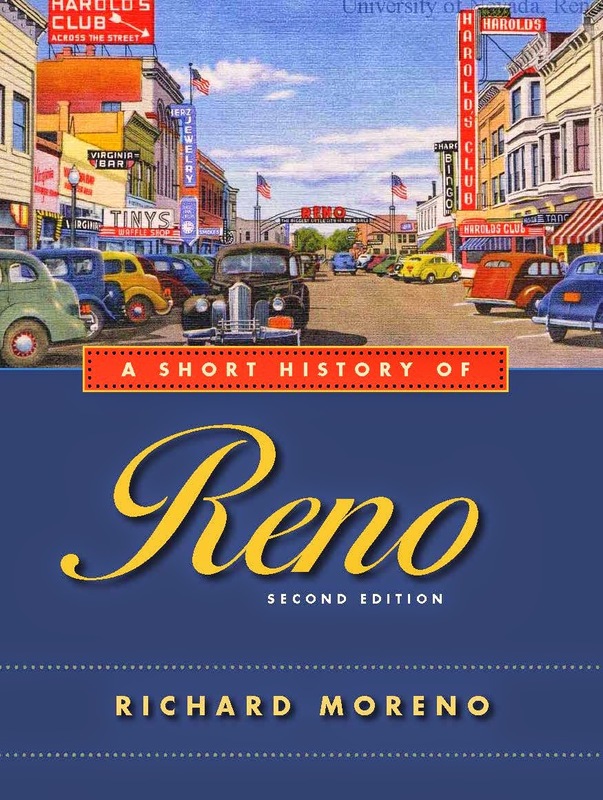 It originally looked at Reno for its new shops, but went east because of cheaper land. To entice its workers to move to the new site, the railroad made a generous offer—a tract of land would be set aside adjacent to a new roundhouse and the railroad would give each employee clear title to a 50-foot by 140-foot lot. Additionally, the railroad offered to transport any existing house in Wadsworth to the new community at no charge. Records show that in the summer of 1903, a drawing was conducted with employee names in one hat and lot number in another, and each was randomly awarded their lot. Some 67 lots changed title that day at a price of $1 per lot. The new town was called “East Reno” for a short time, then “Harriman,” after E.H. Harriman, owner of the Southern Pacific Railroad. Finally, in April 1904, Harriman decided to name the community in honor of Nevada’s popular Governor John Sparks. One hundred years ago, the new town was incorporated and during that same year saw the opening of a depot and freight yard. Additionally, in 1905, the community’s first school was built and a volunteer fire department was organized. Over the past century, the railroad has become a less important part of the town’s economy but has remained an important symbol of the past. The Sparks High School athletic teams are called the “Railroaders” and the downtown’s “Victorian Square” development theme evokes the architecture and style of an earlier rail era. The Sparks Bicentennial Railroad Park in center of the downtown boasts a couple of reminders of the city’s rail roots. One is Locomotive No. 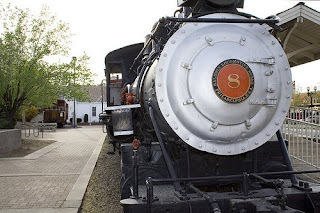 8, built in 1907 by the Baldwin Locomotive Works. The ten-wheeler was one of the last steam engines to operate on the Southern Pacific line and was retired in 1954.